The lives, outside of art, of artists bear only a mysterious resemblance to their work. The concentration of time that must be brought to creating work drains many a writer’s life of incident. And so, an artist like Emily Dickinson can lead an outwardly constrained life while creating an inward empire. Or the man who would eventually be charged with the establishment of the first modern democratic republic could be, as a teenage poet, a love-struck supplicant. Nor does general good character align with artistic success—saints can write bad poetry and flawed people may write good poetry. Pound would live more than another half a century after this, his literary revolution flowing outward until few could see back to its instigator. 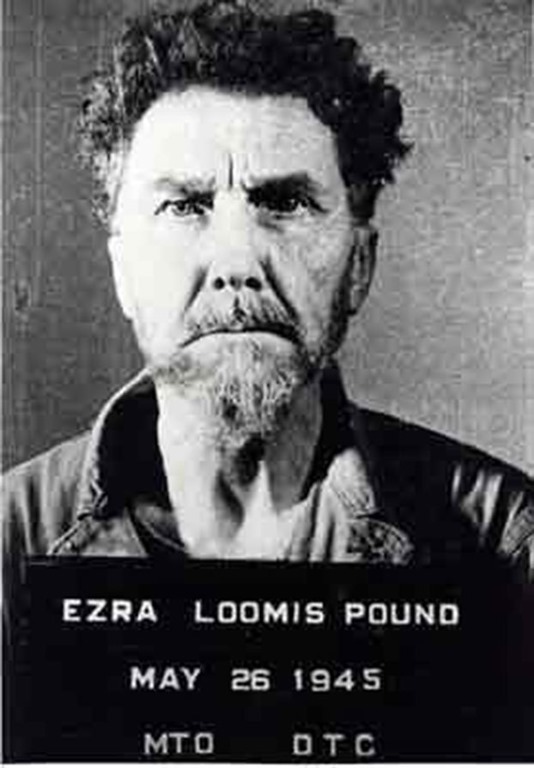 And there’d be reasons his influence would be discounted: by the end of WWII, when Modernism, no longer insurgent, was about to become the established artistic order, Ezra Pound was a 60-year-old man confined in an outdoor steel cage open to the elements, awaiting to be charged as a war traitor with a likely sentence of execution. This guy is most responsible for English literary modernism, but that’s not what got him arrested. The customary quiet and inward life of a writer, even an unnoticed one, looks good in comparison. Though this treatment was inhumane, and the charge not without controversy, it was not unsubstantiated. Pound had spent the years leading up to WWII making common cause with the European Fascists that the United States eventually fought in that war, and when that war was being fought, he broadcast eccentric propaganda in his native English in service of his adopted country of Italy and Mussolini. Furthermore, his attraction to the Fascist cause was not an accident, a casual side-effect of his adopted country of residence. Pound wholehearted seemed to believe in the crackpot and yet deadly racist theories bolstering Fascism. Remember earlier this month when we talked about the popular folk song celebrating Jesse James, versus the reality of James’ life as a racist terrorist? Pound lacked the actual bloody hands of a Jesse James, but not the thought behind them. So much more could be said on this, but that would take more room that we have today, and besides your thoughts and judgements on matters like this, as I said when talking about Jesse James, are more important than mine. Not only are they more numerous, but you are likely younger than me, and will get to use those judgements on things like this to guide your life. Today’s audio piece, “These Fought,” was written by Pound at the height of his fame and good influence—not after WWII, after WWI. Unlike some younger Modernists, Pound did not actually fight in WWI, but situated in England during that war, he saw the patriotic recruitment and the creation of cases for the war, a war that soon became mechanized slaughter beyond all previous imaginings, and he lost friends in that staggering slaughter. So, in “These Fought” Pound caustically calls out the cases for the slaughter, and leads us to note that bravery in fighting WWI, or fortitude in opposing it, were in some sense equal in valor and, alas, equal in success. To hear the LYL Band perform this, use the player below.